They just released the info on the all new A22. New hull and top deck. 2 piece construction now, like the T22 and A24 for 2018. New vinyl for 2019 (2018 was already an improvement from 2017 so interested to see). Power wedge III with Surfpipe is now all 1 option (cant get either seperatly) and provides 5% more lift in lift mode. Option for Rev 10s instead of icon 8s no more 410s. Mobile phone holder is "different"
So far i think the new lines are nice and it looks a big nicer on the water than the A24 from the front. All these new boats are getting heavy, with this one at 4500 lbs. Makes it hard to own a smaller tow vehicle. I'm also not sure on the battery storage location. What if a driver takes a wave over the nose? I know they're in their cases, but even then. All that said, I'm looking forward to hearing some non-influenced reviews as they come out. Currently loving my 2013 A22, but wishing I had power wedge. I just traded in my 2017 T23 for one. Will def post some video and "non" biased reviews I really wanted pw2/3 so im gonna sacrifice a bit of space. Should be fine as we live on smaller private lake. That and you need to offset the prop with a little weight, so I would be interested to see how that goes as well. Just a little bow rise, huh? That's embarrassing. Check out the video at 5:28ish. def gonna have bow rise with power wedge from my experience. A24 is pretty bad, but i think the low down drone angles make it look worse. Are there boats that don't have bow rise while surfing? Is that even possible? I don't surf at all, so it's a serious question. Some boats for sure ride higher than others. Varies between 8-12 degrees. so yea bu's typically have more bow ride when surfing... doesnt bother me. We run a 750 bow sac in the 2017 23LSV Bu we surf, brings it down to reasonable levels and improves the wave substantially. It just doesn’t have enough factory bow weight. U got a pick of the t23 wave? Im not sure if we had all the lead in this day. We have been using the lead in the A24 more. The only real gripe I have is the tower. Just needs an update. The old tower was better to me. The 2019 A22 is really sharp. Without the low profile trailer and mostly loaded, what kinda price should a buyer expect?? Yup. I have about 60 hours on mine. Love it! I've had the previous A22 and T22, this new A22 has a better surf and wakeboard wake. Still bow high, like discussed above but you really can't get around that in an Axis. Great to hear! How are you digging the power wedge 3? ^^Love the new Power Wedge III. More lift and usable settings. Power Wedge II was great but "Wedge 1" really didn't make any difference. They've dialed it in a bit better. Wonder if they will improve the build quality in 2019.. I sure hope so. What don't you like about the way the boats are built? 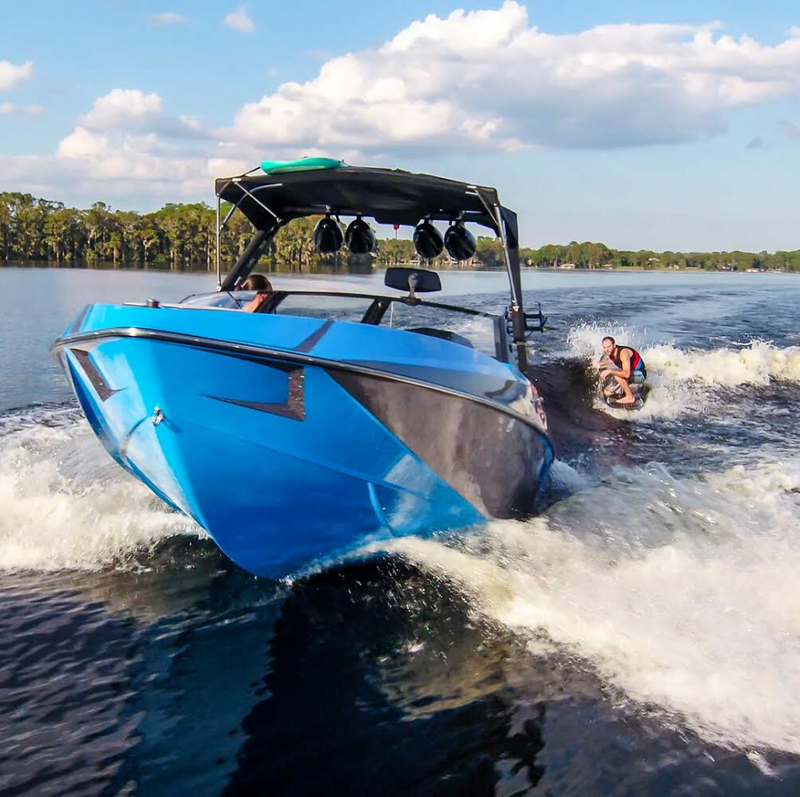 What do you feel is different in the wakeboard wake? ^^You can just get the wake bigger now. I don't run extra weight but you really could if you want because of the PowerWedge III. I looked at few 2018's and the build quality was terrible. Fiberglass strings hanging all over the place under the seats, windshields not closing *1/4" off on top and bottom. Really turned me off. I know the dealer should make sure they are ready to show, but this showed me just how these are put together. No doubt the boat will probably perform, but for $80k, i expected a little bit more attention to detail and will NOT accept shoddy craftsmanship for that price. Not sure what you saw but my experience has been different. I own 18 so I'm biased.But I can tell you that these boats are geared toward the rider first and foremost. Wake wise, they will be on par or surpass anything on the market I can assure you that. I have put 70 hours on mine since august loaded down, rain or shine, smashing dubs and the quality is fine. You can get a more luxury interior feel from other brands for the same amount of money for sure though if that's what you're after. I owned a 15 and a 16. They were both great. A few minor issues but every builder has a few issues here and there. Wasn't that at all. I wish i would have taken pictures. I thought Axis was the exact boat i wanted. I think they look amazing and perform well for boarding and surfing. But as i mentioned, i looked at them all. Not a single other brand had fiberglass string that looked like hair hanging inside the storage areas.. fiberglass shavings as well. As i mentioned the windshield didn't line up and it was certainly an area that would develop some movement. The dash wasn't pretty either. It truly looked like a 3rd grade art project. This was an A20, 2 of them in fact... they wanted 78k plus tax. Sorry, but that kind of attention to detail is important to me. i am not willing to overlook at that. If this kind of thing is overlooked i could only imagine the rest of the boat. maybe the boat is fine, but 78k+tax is alot of cash. I mentioned i looked at the Axis competitors and not a single one had anything like this..